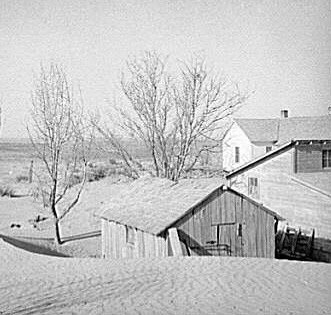 March 1936 near Liberal, Kansas. What looks to be snow is really drifts of dirt and sand. I shuddered, nasty with dust. It floated in the air, everywhere. found it under a mound of dust. I was angry at Ma for letting in the dust. To read the rest borrow the book, or better yet, borrow the audiobook [J AB/CD HES] and listen to it being read. I'm sure you'll feel the grit between your teeth. I was alerted to another work of this type called Rain: A Dust Bowl Story. This story, however, is not in traditional print. It appears online with a poem added each day. It have been ongoing since August. A nice feature is that readers can contribute their "own personal observations of literature, history, and human nature. The author, Shelley Shaver, will visit the blog daily and respond." It's too bad that more people haven't taken advantage of this feature. The comments are few and far between. Thus, I'm featuring the site today in hopes that you'll visit it and comment. Someone had a bigger loan. 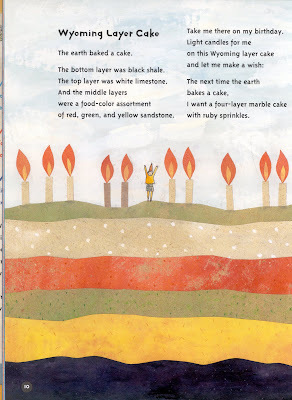 Anastasia Suen hosts the Poetry Friday Round-Up this week at Picture Book of the Day. Stop by! The Independent had a feature article called "Why We Worry Too Much about Health". Do you want to know my theory about why we worry too much about health? It's simple--to keep book publishers in business! If people were to stop worrying, they'd stop buying self-help books. And, probably a third of our circulation would disappear. Seriously, though, I think part of our problem is we go to too many doctors. Specialists have taken the place of the general practitioner. You go to one doctor for your intestinal dysfunction who tells you to do something that completely goes against something that your heart doctor told you to do. Of course you're going to worry! Rather than worry, you should talk to your doctors! But, that's probably not going to happen for many people, so they turn to self-help books. My friend, Barbara Turner, wrote an interesting post about a new book marketing tool, the book trailer. I thought I'd look for a few trailers for books that we own here at the library. If you like the trailer, then come down and borrow the book! "Full steam ahead!" I swear that's what the people who plow my street say as they come around the corner and see my mailbox. I might as well put a great big target on the side. Actually, I don't need a target since they manage to hit it every year. Last week they not only took out the box, they took out the whole post, too. Oh well, it's just one of the joys of living in the New England. 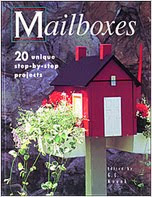 Since I have to replace them so often, I only buy inexpensive mailboxes, but, if I ever get a secure base, I might go all out and decorate a box like those found in Mailboxes: 20 Unique Step-By-Step Projects [684.18 MAI]. I DO NOT Endorse This Kind of Behavior! Don't try the sign activity shown on the site urlesque: exposing bit of the web--it's against the law! Just look here to discover some really creative ways people have altered STOP signs. The stop sign got me thinking about the universal signs and symbols that we have come to take for granted. That thought led me to an article, "Navigating Today’s Signs: An Interview with Mies Hora," from the professional design organization AIGA. Mies Hora is a "sign and symbol maven." It's an interesting article about sign literacy. I'd never even considered literacy in relation to signs, that's because I've always taken it for granted. Check out the images on the right-hand side of the page where you'll find the stop sign (fig. 2). Signs have been around nearly forever, or at least as far back as the people who made cave drawings. In more recent history, signs have been used to advertise. 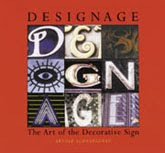 We have a fantastic photo-illustrated book called Designage: The Art of the Decorative Sign by Arnold Schwartzman [741.6 SCH]. Sit down and peruse it the next time you visit--you don't need to be sign literate to enjoy it! This has been the week to learn more about geology. Sadly, for the people of Haiti, the earthquake isn't metaphorical. Children's book publishers have found that alternative ways of teaching science are a welcomed change for many teachers. 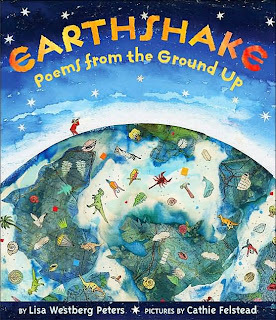 Earthshake: Poems from the Ground Up by Lisa Westberg Peters [J 811 PET], introduces children to concepts of geology through poems. The poems are accompanied by colorful collage illustrations by Cathie Felstead. Of course, a good teacher will use the poems as a starting point for an exploration of the inner workings of our planet. One place to look for additional information is the U.S. Geological Survey/National Park Service's site. 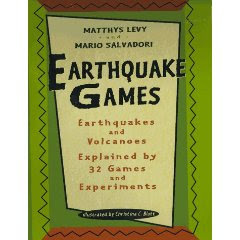 When the regular classroom teacher is done teaching geology, she/he can hand the book over to the art teacher. Kids can look at the book as an example of collage and be inspired to create their own illustrations. It's win-win all around! 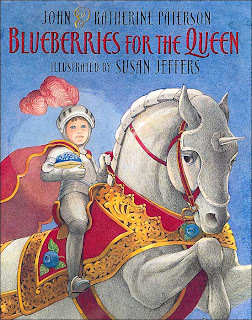 This week's Poetry Friday Round-Up is hosted by Liz Scanlon at Liz in Ink--while you're there, make sure you congratulate Liz on the Caldecott honor awarded this week for her book, All the World [JP SCA]. One of New England's most prolific mystery writers was Robert B. Parker, who passed away on Monday at the age of 77. What with titles in multiple formats such as regular print, large print, and audiobooks, there are 89 Robert Parker items in our catalog. We used to have more, but some of our copies were so old and ratty (in other words, well-read), they had to be thrown out. I'm not a mystery reader, but I did go through a "Spenser" phase a few years back. I enjoyed the characters and finding Boston area landmarks within the stories. Parker's latest Spenser novel, #37, published in the fall, was The Professional. A knock on Spenser's office door can only mean one thing: a new case. This time the visitor is a local lawyer with an interesting story. Elizabeth Shaw specializes in wills and trusts at the Boston law firm of Shaw & Cartwright, and over the years she's developed a friendship with wives of very wealthy men. However, these rich wives have a mutual secret: they've all had an affair with a man named Gary Eisenhower- and now he's blackmailing them for money. Shaw hires Spenser to make Eisenhower "cease and desist," so to speak, but when women start turning up dead, Spenser's assignment goes from blackmail to murder. To learn more about Parker, check out the interview at MysteryNet.com. The United States Geological Survey has a website devoted to earthquakes. Click here. For specific information of the quake in Haiti, click here. The USGS also has a separate site with information for kids. Everywhere you look there are online sites directing you to sites that are collecting funds for Haiti. But, which one should you pick? I'd like to suggest Partners in Health. This organization is based in Haiti and has a care network already in operation. The founder of Partners in Health, Paul Farmer, is the subject of a book by Pulitzer Prize winning author, Tracy Kidder. Mountains Beyond Mountains [B FAR] was released in 2003 and was a popular book club choice for a number of years. I imagine it will be in demand once more. Thanks to a true team effort, at the general hospital in Port-au-Prince alone, we helped get 7 operating rooms up and running, performing surgeries around the clock. By tomorrow night, we should have 10 or 12. At our sites in the Central Plateau and Artibonite regions, we have eight more functional operating rooms that are already supplying surgical and medical care to hundreds of earthquake victims fleeing the destruction of Port-au-Prince. And thanks to a partnership with many people and organizations here in the U.S., we've filled 10 planes with surgical teams and supplies, and have many more scheduled flights throughout this coming week. Dartmouth had its incoming freshman class read Mountains Beyond Mountains as a class project. A program was held at the school and Dr. Farmer was one of the speakers. 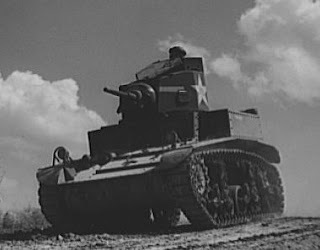 It was recorded and may be viewed below. The library is closed to celebrate Martin Luther King day, we will reopen tomorrow morning at 9:00 AM. If you're too young to remember Dr. King, the video below will give you some idea of his oratory skills. In a film I saw at a social justice symposium, a man of color asked this question of the viewer--"Have you ever wished to be black? If the answer is 'no,' then there's no equality." I ask you to think about this--it sure made me stop and think. We've come a long way, but we still have a long way to go. Those of us in the U.S. often think of America as the artistic center of the universe. Not so! There is so much going on elsewhere in the world that we should be ashamed of not being more aware. One way to change our point of view is through the poetry found in The Poetry of Our World: An International Anthology of contemporary Poetry [808.81 POE], edited by Jeffery Paine. The jacket copy describes it as an anthology that "includes some of the most revealing, meaningful, and beautiful poems of the second half of the twentieth century, fully representing the diverse range of poetry around the globe." 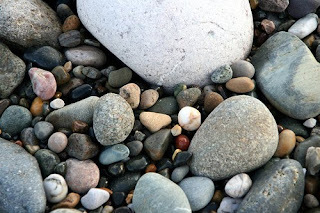 Here's a poem by the Polish writer, Zbigniew Herbert, called "Pebble" (translated by Czeslaw Milosz and Peter Dale Scott). Take a walk along a New England beach some time and try NOT to think about this poem! This week's Poetry Friday Round-Up is being held at Great Kid Books. Make sure you stop by! Children's writer, Katherine Paterson, was recently named National Ambassador for Young People’s Literature. She replaces Jon Scieszka, who has served since 2008. Paterson has chosen "Read for Your Life" as the theme for her term. Paterson, a long-time resident of Vermont, has spoken at many conferences that I've attended over the years. If you get to hear her speak, you won't be disappointed. The next best thing to seeing her in person, is viewing a video interview such as the one found on the Reading Rockets website. "medical charlatan," 1638, short for quacksalver (1579), from Du. kwaksalver, lit. "hawker of salve," from M.Du. quacken "to brag, boast," lit. "to croak" (see quack (v.)) + zalf "salve." Cf. Ger. Quacksalber, Dan. kvaksalver, Swed. kvacksalvare. I guess a continual boasting is a bit like a quacking duck afterall! 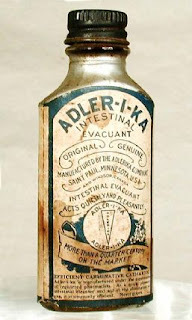 The old traveling medicine show with its "snake oil" salesmen is an enduring image from American culture, and for many years, in the early part of the last century, patent medicines were a staple in American families. Many, if not most, of these medicines were of dubious value! There are several interesting online exhibits of patent medicine. Two may be found at the Hagley Library, and at the National Museum of American History. a controversial medical doctor who became wealthy by using goat glands to "cure" impotent men; and chronicles his relationship with Dr. Morris Fishbein, the editor of the Journal of the American Medical Association who was determined to expose Brinkley as a fraud. I came across a website called the Quackometer: Experiments and Thoughts on Quackery, Health Beliefs and Pseudoscience. I'm not making a statement about my beliefs, one way or another, about homeopathy (the primary focus of the siteowner), I just thought the site was interesting and thought I'd share it. This treasure trove of little-known facts, written by a seasoned health reporter, provides invaluable tips, tools, and resources to help readers think more critically about what they're being told. Becoming a healthy skeptic is vital, Davis argues, because following the right advice can have a profound impact on overall health and longevity. Always Follow the Elephants: More Surprising Facts and Misleading Myths about Our Health and the World We Live In by New York Times columnist, Anahad O'Connor, is another book that will provide information about medical claims. It is on order and should be on the "New Books" shelves in a few weeks. 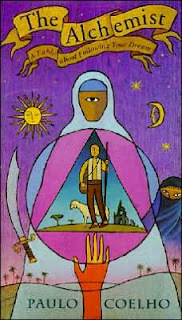 If pseudoscience intrigues you, we have Voodoo Science: The Road from Foolishness to Fraud by Robert L. Park [509 PAR]. The title alone was enough to make me pick up the book! A few months ago I posted about a recently come-to-light work by Leonardo daVinci. Now comes news that there is possibly another new daVinci, and, it may be at the Museum of Fine Arts in Boston! This newly discovered work reminds me to mention that we have a library museum pass program. The program includes a pass to the MFA, which is donated to us by F.L.O.W. , our Friends group. To learn more about our pass program, click here. I'm not saying that the new daVinci may not be real, but, there are some clever, but misguided, people who have forged works of art in the past. To read about some, look for Fakes and Forgeries: The True Crime Stories of History's Greatest Deceptions: The Criminals, the Scams, and the Victims, by Brian Innes [364.163 INN]. I hadn't heard of Linda McCarriston before this week when I found a skinny paperback, pushed almost out of sight, between two hardcover books of poetry. 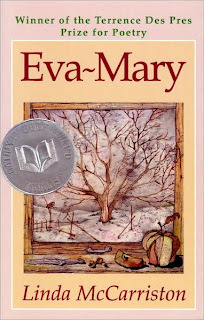 The book, Eva-Mary [811 MCC], revealed to me that Linda McCarriston was a poet of some renown--the cover of Eva-Mary sports a National Book Award Finalist silver sticker. Like a curious crow, I am attracted by shiny things! and the hallway's impersonal riot. If you want to read the rest, come down to the library and borrow the book (I'm sorry I couldn't find a copy online). I'm glad I looked inside Eve-Mary, it reminded me, once again, to view people with a more sympathetic eye--you never know what's going on in their lives. McCarriston was interviewed by Bill Moyers back in 2002. The transcript can be found here. The Poetry Friday Round-Up this week is being hosted at one of my favorite blogs, The Miss Rumphius Effect. Be sure to check it out! In the Himalayas, a tree frog with big red feet has been found. The size of its webbed feet enables it to glide when falling from a tree, thus it has been named, the "flying frog." 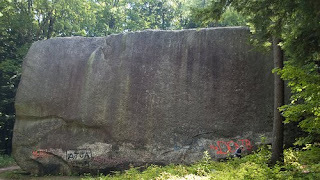 You would think that there is nothing new to discover in most areas of the world, but it ain't so. Read about several newly discovered species here on the Discovery Channel website. A "book autopsy" will be held at the Library on Wednesday, January 27, at 7:00 PM. The workshop will give readers the skills to determine the strengths of a book by asking certain questions about character, plot, and theme. To determine a book's strengths, a procedure must be followed--a series of steps, like with an autopsy--that lays bare the guts of the book. Then, after gathering all the evidence, the reader can come to a conclusion: is this book good, and if not, why? Workshop leader, Julie MacShane, is a writer and editor. To learn more about Julie, visit her website. "My Heart Is Afraid that it will have to suffer," the boy told the alchemist one night as they looked up at the moonless sky. "Tell your heart that the fear of suffering is worse than the suffering itself. And that no heart has ever suffered when it goes in search of its dreams." Copies of the book are available at the Nesmith Library for workshop participants. Space is limited to 15, so please visit or call (432-7154) to register. 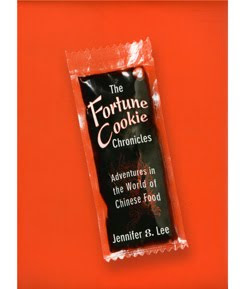 I found chapter 5, "The Long March of General Tso," most interesting since I have long been a fan of the General's chicken (and his fried tofu, which isn't always on the menu) and have often wondered who the man behind the name is or was. You won't be surprised to find that the General really had nothing to do with the dish. 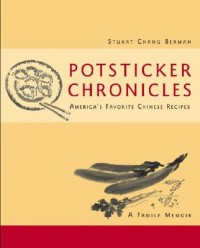 Isn't it funny that we have another book about Chinese food with the word "chronicles" in its title, Potsticker Chronicles: America's Favorite Chinese Recipes: A Family Memoir by Stuart Chang Berman [641.5951 BER]? It's a bit unorthodox, but frequently I make this dish and put it on a hard roll or a piece of baguette. Better yet, I'll add a slice or two of cheese and melt it briefly under the broiler for "Chinese Cheesesteak." In recent years, I have minced up some jalapeno, serrano, or Asian chilies and put them in the marinade to give this dish a bit of a kick. The other day I was asked if we had a copy of Romeo and Juliet, the Shakespeare play. "Of course we do!" I said. "We have it in multiple forms, what are you looking for?" 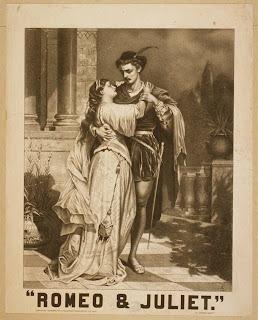 The person I spoke with was surprised to find that we have Romeo and Juliet in several collections of Shakespeare's plays [822.33 SHA], a "No Fear" version, which is billed as "The play plus a translation anyone can understand" [822.33 SHA], the BBC filmed version of the staged play [DVD 822.33 SHA], the 1968 Hollywood hit directed by Franco Zeffirelli [VIDEO ROM], and a graphic novel version adapted by Richard Appignanesi [YA CX APP]. We even have the music to the ballet by Prokofiev, "Romeo i Dzhul'etta" [CD CLASSICAL PRO], which was inspired by the play. The only thing we don't have is the "Cliff's Notes" Romeo and Juliet! With so many versions of the play, you'd think that it was incredibly well-known and familiar. It turns out to be misremembered, as is evidenced by a recent off-Broadway production!